A splendid publication, compiled and edited by Surya Prakash Sharma, World Cup Cricket, covers a statistical survey of India's march upto World Cup 2015; biological details, statistics and career progression of each Indian player apart from the Trivia, First Facts and Records and Chapters' Heights. 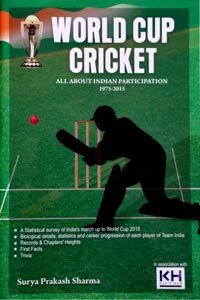 Quite impressed with the contents of the book, Prof. Raghuveer Singh Rathore, International Test Umpire, has contributed the foreword: "I have not yet come across a book exclusively on statistical compilation on Indian participation in the World Cup competition. This one may be the first, really a different kind of efforts. I congratulate him for his painstaking deep statistical research. He has successfully brought out some unpublished methods of presenting figures. Along with career averages, records, some trivia and first facts on the pages have made it immensely readable. The book will prove to be a comprehensive record to the participated players' satisfaction and a rich treasure for researchers' reference libraries. Such a book was absolutely necessary." An absorbing compilation of the sections, namely Believe It! and First Facts are the highlights of this publication. Cricket enthusiasts are informed that just six batsmen have registered hundreds while chasing - Sunil Gavaskar, Sachin Tendulkar, Ajay Jadeja, Sourav Ganguly, Shikhar Dhawan and Suresh Raina. Twenty five centuries have been recorded for India in the World Cup fixtures. Only Australia could manage more (26). 1975, 1979 and 1992 are the only three editions without a single hundred by an Indian batsman. Cricket lovers are further informed that two Indian legends Rahul Dravid and Anil Kumble were never adjudged with the Man of the Match awards. The publication has been painstakingly researched and lovingly compiled. What is most remarkable is that so much has been packed into a book of 356 pages, with everything set out with such clarity and attention to detail. Surya Prakash Sharma and Sharman Books have produced a worthwhile book on World Cup Cricket.